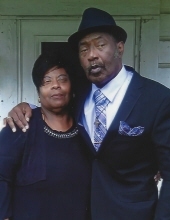 Celebrating the life of Dewayne A. Loville, Sr.
Obituary for Dewayne A. Loville, Sr.
Dewayne A. Loville, Sr., 65, was born on October 26, 1953 in Los Angeles, CA and passed away on March 17, 2019 in Houston, TX. He is preceded in death by his mother Betty Jean McCullough, father James Loville, stepmother Aubrey Loville, brothers Rodney Loville and Anthony Loville. Dewayne is survived by his loving wife Nettie Marie Loville; children TaShina Loville, Shandra Garner, Dewayne Loville, Jr., Desiree Jarmon, and Larry Jarmon; sisters Vessa Loville, Sherlyn Gonzalez and Erma Caswell; brothers Vernon Loville and John Loville; grandchildren Jeremy Lathan, Ryane Loville, Dewayne Loville III, Kevin Garner, Jr., Regan Loville, Kristopher Garner, Kolin Garner, and Rylee Loville. The family will receive friends on Friday - March 22, 2019 from 11:00 AM to 12:00 PM in the chapel of Cypress Creek Funeral Home and Crematory. Friday - March 22, 2019 in the chapel Cypress Creek Funeral Home and Crematory. To send flowers or a remembrance gift to the family of Dewayne A. Loville, Sr., please visit our Tribute Store. "Email Address" would like to share the life celebration of Dewayne A. Loville, Sr.. Click on the "link" to go to share a favorite memory or leave a condolence message for the family.